Recently discovered parchments in theEgyptian University of Al-Azhar have finally made it possible to identify the current location of the Holy Grail. This extraordinary discovery led Margarita Torres Sevilla and José Miguel Ortega del Río on a three-year investigation as they traced the Grail’s journey across the globe to its final resting place in the Basilica of San Isidoro in León, Spain. Having been kept in Jerusalem until the eleventh century, the chalice was given to the Muslim prince of Dénia (in Spain) by the caliph of the Fatimid dynasty (rulers of an empire that spanned the Middle East and North Africa). In turn, he presented it to Ferdinand I of León and Castile, as a gesture of respect and appeasement. It is still there today, in León’s Basilica of San Isidoro. Newly translated by Rosie Marteau, and including a 16-page full-colour plate section, this is the definitive book on one of history’s most sought-after treasures, the object of both Arthurian myth and Christian legend, and has made headlines worldwide. 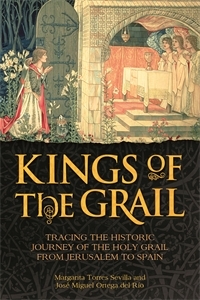 Kings of the Grail presents the new historical and scientific facts that have come to light, supported by meticulously researched information on the history of Judaism and early Christianity, the significance of the Last Supper, and the other cups that have previously been identified as the Holy Grail. Margarita Torres Sevilla is Professor of Medieval History at the University of León and Visiting Scholar at St John’s College, Cambridge. Amongst her other books she has published titles on El Cid and Enrique of Castile as well as two novels in Spanish. José Miguel Ortega del Río has a Phd in Art History at the University of Valladolid and a Masters in Museology from the Complutense University of Madrid. He has worked as a writer, editor and journalist and has also organised large exhibitions in Spain, New York, Rio de Janeiro and Paris. Rosie Marteau read Modern & Medieval Languages at Cambridge University and translates Spanish and French. Her literary work includes Washing Dishes in Hotel Paradise by Eduardo Belgrano Rawson andRed Tales by Susana Medina.